Trial sites in northern and southern Florida are relatively new additions to the Eastern Broccoli trial network. 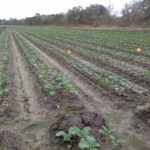 In St. Johns County in northern Florida, Lincoln Zotarelli with the University of Florida (UFL), Gainesville oversees both Quality and Yield trials. Monica Ozores-Hampton with UFL’s Southwest Research and Education Center (SWREC) conducts a Yield trial in Collier County. 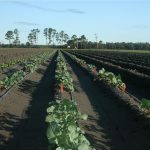 The climate in Florida is sufficiently mild to allow commercial vegetable production in the winter. 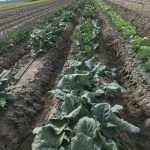 Growers direct-seed or transplant their broccoli crops, and seepage irrigation is commonly used to control soil moisture. Sandy soils are a characteristic of the state, but underlying clay hardpan in some areas can cause poor drainage. Precise management of agricultural inputs is necessary to prevent nutrient runoff and leaching, and to protect both surface water and the underlying aquifer system. Florida Quality trials, which began in Fall 2017, are conducted by Zotarelli at the Hastings Agriculture Extension Center. The three plantings each season are transplanted in October, December, and February. The first-ever Quality trial planting at this location was transplanted onto bare ground in early October, in rows 40 inches apart with an 8-inch in-row spacing. Photos in the gallery that follows are from the first planting of the 2017 Quality trial. First Quality trial planting in St. Johns County, Florida. Several large-acreage vegetable growers are located in the vicinity of St. Johns County. Broccoli here is often grown in rotation with cover crops. Following the production practices common to the area, Zotarelli direct-seeds the St. Johns Yield trial into double rows on bare-ground, raised beds. The trial is planted in December for evaluation in late March, the warm end of the spring harvest season. The Collier County site is the southernmost location for Eastern Broccoli Yield trials. 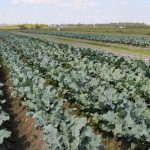 January through February is the normal harvest season for broccoli in this region, but heat-resistant varieties could potentially extend that window into March and early April. 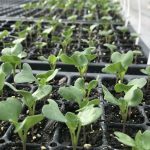 Broccoli here is commonly planted in single rows on open beds on three-foot centers (the method Ozores-Hampton employs for her trials) or in double rows on polyethylene mulch-covered beds on 6-foot centers. Both methods use a between-plant spacing of 8 to 10 inches. Under previous SCRI funding and before Florida trial sites were officially part of the Eastern Broccoli Project trial network, Zotarelli and Ozores-Hampton conducted Yield trials (then called Phase III trials) in their respective locations in 2014. The photos below are from those trials. Hastings Phase III (Yield) trial in January 2014. Immokalee Phase III (Yield) trial in March 2014.